Moneyfields have been left angry and heartbroken after having their maiden Wessex League premier division title snatched away three days after the end of the season. The Dover Road club finished the season top of the league – two points in front of their nearest rivals Portland United. However, the title has been handed to the Dorset outfit after Moneys lost yesterday’s appeal at the Football Association against a three-point deduction. 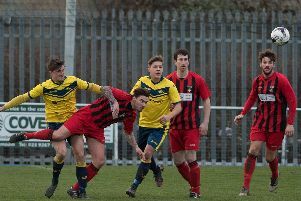 The deduction has been hanging over the club since the Hampshire FA found them guilty of fielding a player under suspension at the start of the year. Confusion arose after Ash Howes was signed from rivals Blackfield & Langley and Moneyfields chairman Paul Gregory is frustrated about the whole affair. He said: ‘The whole thing is a travesty, unfair and ridiculous. ‘Ash Howes signed for us on December 13. ‘On the same day, Blackfield put the two games he would have been suspended for them on the Hampshire system. ‘The player didn’t know and we weren’t told either. ‘He then went away on holiday to Thailand for three weeks. ‘By the time he came back, Blackfield’s two games had gone, so he was removed from the Hampshire system. ‘Our secretary checked the county system of suspensions before we included him in the squad, making sure he wasn’t on it. ‘That is what clubs are told to do. ‘Then, on January 7, we brought the player on as a substitute for the last five minutes against bottom of the league Verwood Town. ‘We were winning 3-0 at the time. It is obvious nobody in their right mind would knowingly bring a suspended player on. That is just common sense. ‘We feel very bitter about the whole thing. It is a massive kick in the teeth. ‘After all the hard work put in, this just leaves us gutted. Wessex League secretary John Gorman confirmed the failure of Moneys’ appeal would lead to the punishment being applied. That means Portland will be named champions. However, it doesn’t affect Moneyfield’s promotion to the Southern League. Only one club are promoted but Portland didn’t apply to go up, leaving Moneys to take their place. ‘All we are doing is applying the rules as we understand them,’ said Gorman. ‘Moneyfields have been found guilty of fielding an ineligible player. Moneyfields are now left with the task of getting over their disappointment as they prepare to play at the highest level in their history next season. n Bognor host Wingate & Finchley in the Ryman League premier division play-off semi-finals tonight (7.45pm). The final will take place on Monday.